CSE’s Shop includes t-shirts, sweatshirts, posters and pronoun buttons celebrating LGBTQ life in the South. All proceeds go directly to our work for full LGBTQ equality. Click here to shop online for t-shirts (including our Summer ’18 Limited Edition shirt), sweatshirts and more. Click here to shop online for posters and buttons. And if you’re in our hometown of Asheville, NC, swing by Horse and Hero, an amazing local shop and supporter of CSE, to find t-shirts, buttons and posters (located at 14 Patton Avenue, Asheville). 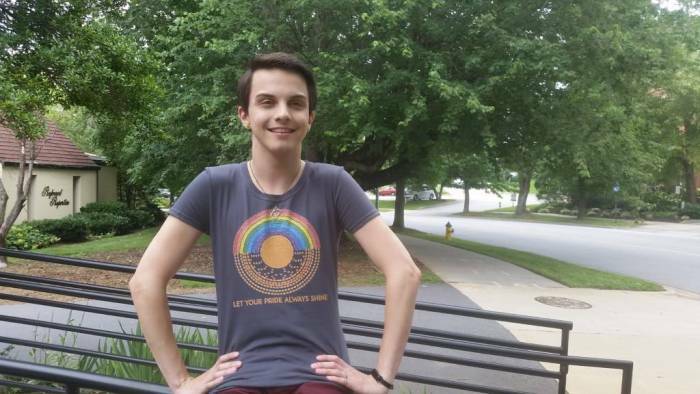 Our awesome intern, Andi, wears our limited-edition “Let Your Pride Always Shine” t-shirts, designed by Asheville artist Liz Williams. We can’t make them fast enough . . .